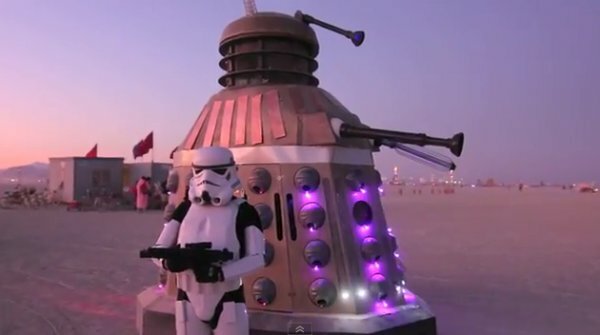 Burning Man has always hosted a large number of nerds. As time goes on and technology becomes more pervasive and sophisticated, new capabilities are unlocked for the citizens of Black Rock City. Some Luddites say “no! We are pagans, we are druids! We are burning an effigy and riding bicycles and tripping on psychedelics! Smart phones are evil”. Others say “get with the times, grandpa”. The NextWeb has a story by Ryan Matzner, who has not yet been to Burning Man. He’s bringing with him the Radically Inclusive Community Gift of connection to the Internet. If enough people with smartphones install these apps, then the whole festival will be wired. This is a pretty cretive way to promote your app and it launches it with many users, rigt away. Ryan Matzner is the Director of Strategy at Fueled, a mobile design and development shop based in NYC and London. In just over a week, I will make my first pilgrimage to Burning Man. And while I look forward to leaving the mainstream grid to frolic with fellow creative creatures, I’m not so keen on what I understand is a common struggle at Burning Man: losing track of your friends on the playa. Some people will rely on printed Facebook invites and directions from BurnerMap to find their friends, but these days, workable printers only exist in offices with PCs. And once you’ve left that Walmart in Reno and all other traces of civilization behind, you’re on the playa with no cell coverage and only limited oases of Wi-Fi, meaning you can’t rely on texting to find your mates. Or at least it did mean that… until now. In iOS 7.1, Apple quietly enabled technology we’ve been talking about for years. It’s called mesh networking, and it’s about to get seriously revolutionary. There’s a couple useful devices out there that connecting users offline, including Bluetooth-powered goTenna, but with mesh networking, all you need if your phone. Apple’s Multipeer Connectivity Framework gave developers a platform on which to create mesh networking applications. It’s the same platform that Apple’s AirDrop uses to share files directly via Wi-Fi and Bluetooth, without the need for any intermediary devices. App developer Open Garden has taken advantage of this new technology by building a proof-of-concept chat app for iOS and it’s about to bring mesh networking to the masses. The team also offers an Android version, which relies on Open Garden’s own mesh networking platform. 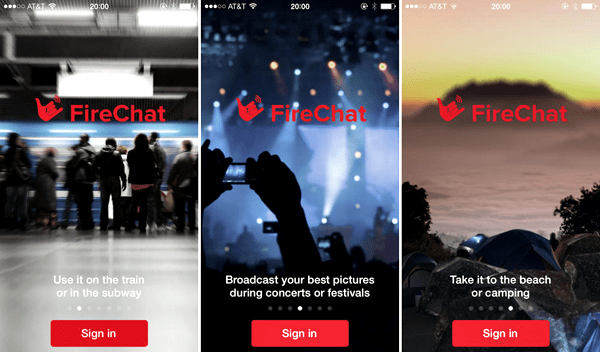 The app, called FireChat, and others like it, is the tool for finding your friends at Burning Man. …out on the playa at Burning Man, there is no pervasive, reliable, centralized network to collect and redistribute our messages. If there’s a high enough density of devices using mesh networks on the playa, my message gets passed along from device to device to device (each serving as a node in the network) until it finds its way to my friend a half mile away over in Camp Contact. Meanwhile, my device is helping pass along the messages of everyone else in the mesh. There’s no server needed, no weighty infrastructure, just all us individuals and our connected devices, weaving together the community one packet at a time. … Burning Man traditionalists are going to say this is mainstreaming the Burning Man experience…there’s a principle of immediacy to be upheld, and that it’s important to directly experience what’s right there in front of you. That’s cool. But when I’m having that mind-blowing experience, I want to send out a call to my friends to come experience it with me… immediately! Radically Inclusive: Anyone can join, no password needed, no sign-up required, all are welcome. Communal Effort: We each do our little part, and the tech self-assembles amongst us. Gifting: You’re giving freely of your device’s connectivity to everyone else in the mesh, simply by being on the playa. You won’t even know to whom you’re giving these gifts or when they’re receiving them. It will simply be happening, in the background, all the time. It’s also a brilliant example of the power of community. The more we connect, the stronger the mesh will get, and the more useful the network will be for all of us. Mesh networks are changing the game. So, consider these tips and download some apps before you drop out of civilization and, when you arrive on the playa, join me on the network. We’ll wrap the Man in mesh and light him up with shared connectivity. See you there. I don’t think a meshnet will work very well in BRC, but the idea of a global meshnet is the way forward. The Internet’s days are numbered as a communication platform. We’ll still use it to make airline and hotel reservations and buy crap on eBay, but actual anonymous communication (an unstoppable, uncensored, balls-to-the-wall communication) will require a meshnet. Once this reaches a critical-mass of about 10% of the population, it will become the net ‘Internet’.